Sand, surf, Painkillers . . . . 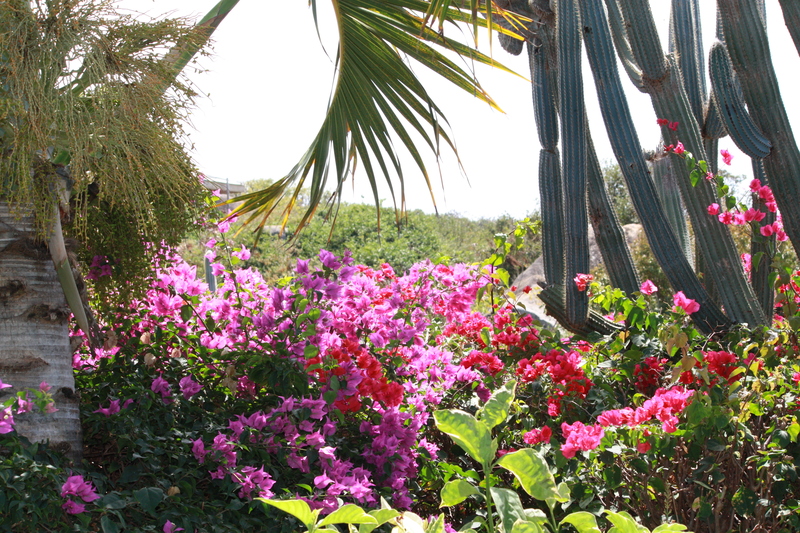 Escape to the Virgin Islands and discover a truly unique way to leave the snow and cold Wyoming winds behind. Located about 90 miles east of Puerto Rico, the islands extend into the Caribbean Sea on one side and the Atlantic Ocean on the other. The Virgins form an archipelago which is divided between the U.S. and British, and are located in the Leeward Islands of the Lesser Antilles. 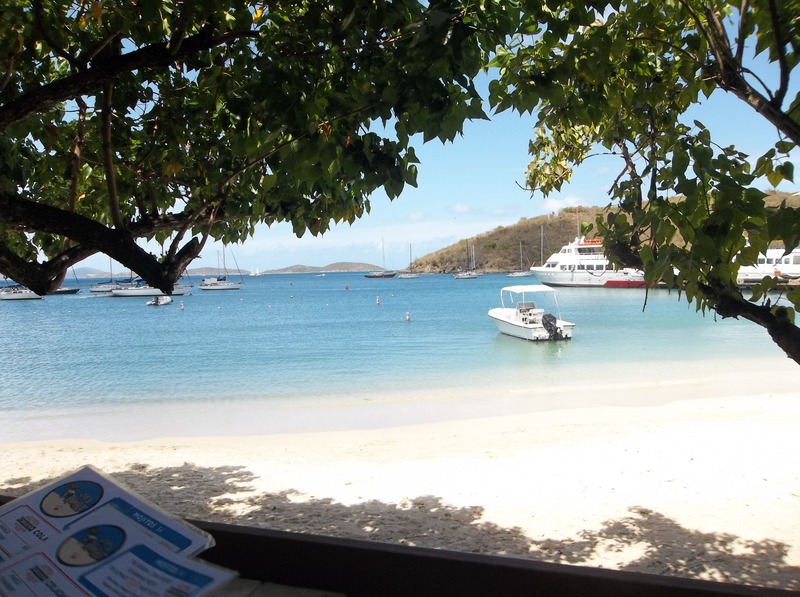 This view is from a restaurant at Cruz Bay, St. John, U.S. Virgin Islands. The town is so small they don’t name most of the streets. Roll on, thy deep, dark ocean . . . .
On the U.S. side, there are four main islands: St. Thomas, St. John, St. Croix and Water Island. St. John is our favorite destination, as the U.S. National Park Service owns more than half of the island and many acres of coral reef. 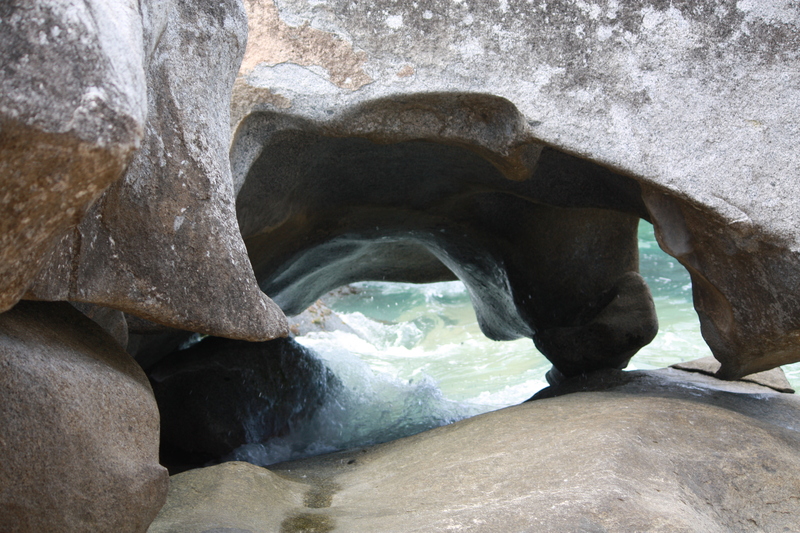 The Virgin Islands National Park sprawls through the interior and encompasses almost all the coastline. White sand beaches are unsurpassed and relatively uncrowded, and average temperatures in March range in the 80’s. 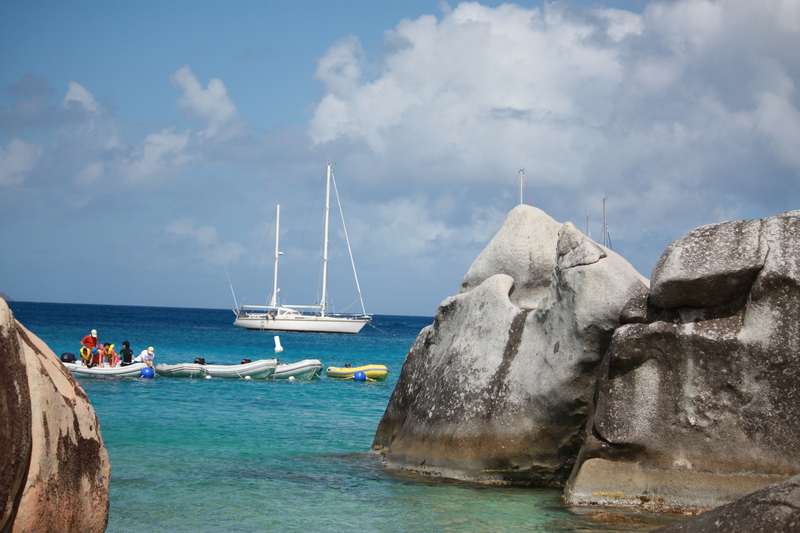 Sparkling clear water makes for great sailing, snorkeling, swimming or just listening to the waves splash up on shore. 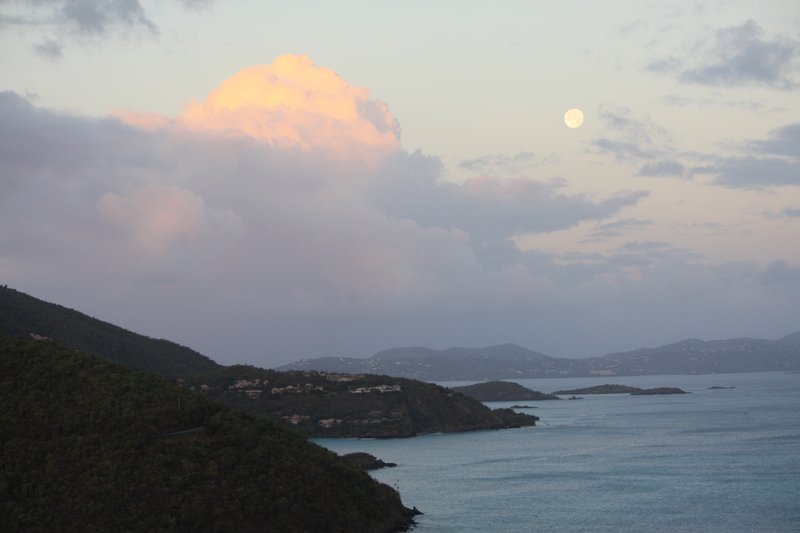 Cinnamon Bay is featured above. Sunrise or sunset? . . . .
Taken from the deck of our studio at dawn. 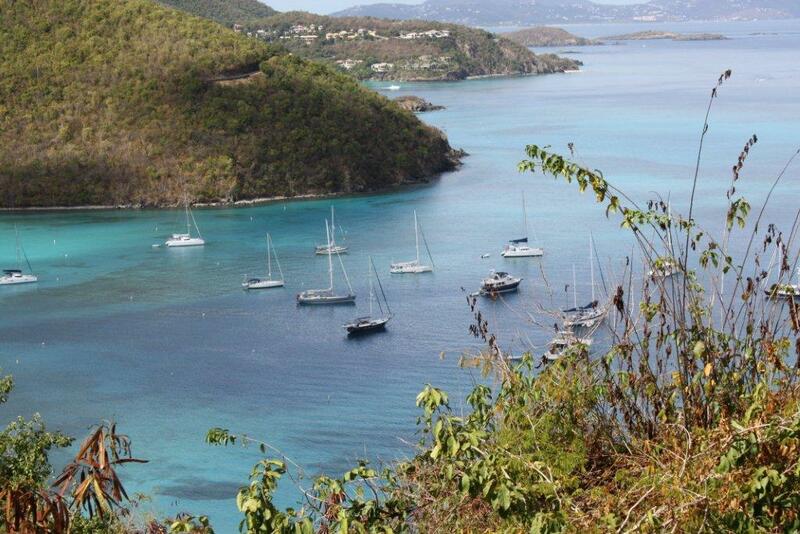 The island in the background is St. Thomas, a twenty minute ferry ride away. Looking down at Maho Bay. By the light of day . . . .
Maho Bay is a popular destination for sail boats. 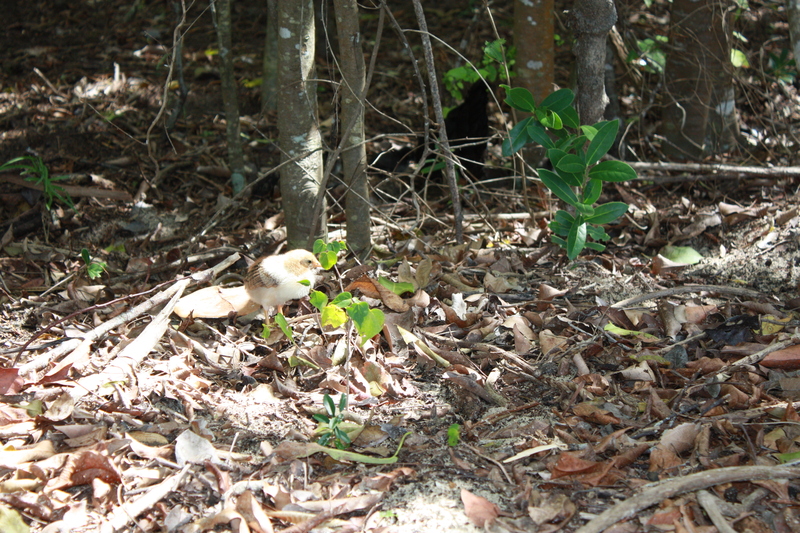 They arrive in droves for the prime rib dinner on Saturday nights at Maho Bay Camp where we rent a studio. Dirty Harry was waiting for us to return this year, and was as irascible and impatient as always. He has had a rough year, and was healing from an injury that left his right eye almost completely destroyed. It didn’t slow him down much, and he was as imperious as we remember him from last year. 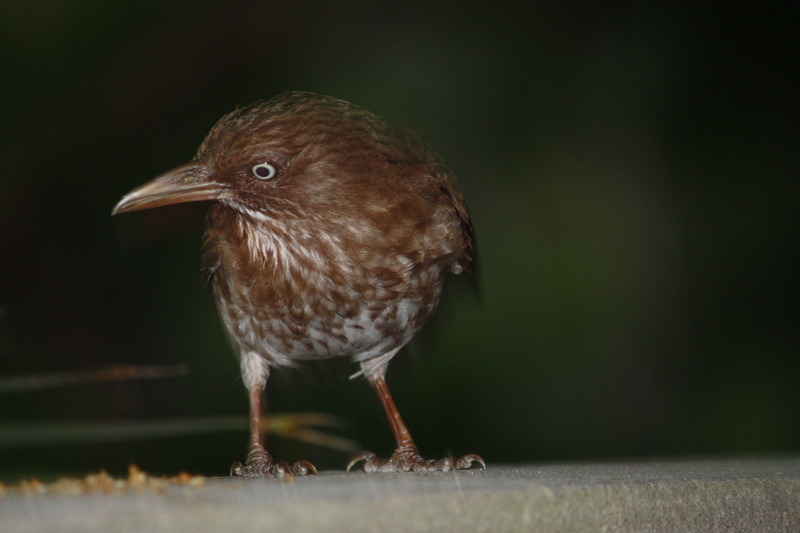 He sits on the railing of our balcony and puffs up his feathers, strutting to and fro. His favorite food is crumbled granola bars and he hops up and down in excitement when we scatter them for him. Ghostly remains of a once-grand plantation . . . . The islands are volcanic and most of the early dwellings are stone with decorations of conch and a wide variety of sea shells. 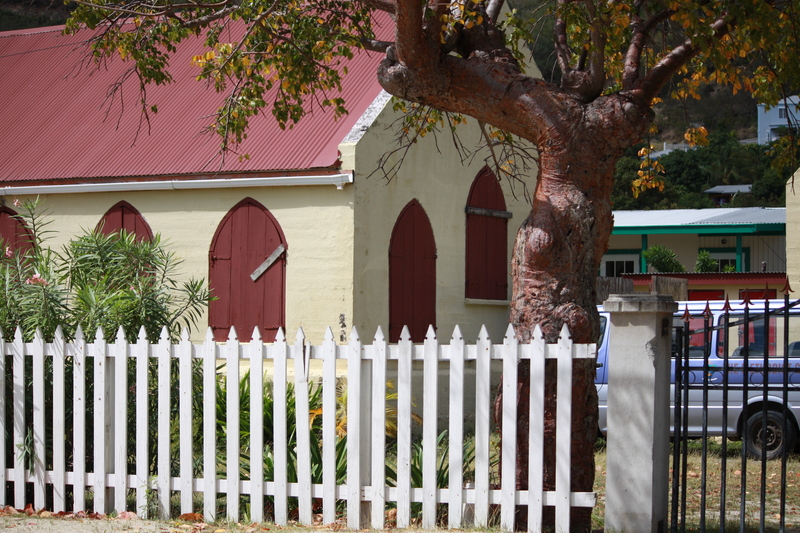 Settled by the Danish West India Co. in 1694, sugar cane drove St. John’s economy during the 18th and 19th centuries. Hey, wait for me . . . .
Feral chickens abound on the island, and this little chick is trying to keep up with a hen and three siblings touring along the edge of the beach. My nap was interrupted by frantic peeping, and I rummaged in my bag for something to feed them, to no avail. Come up and see me sometime . . . .
Another day in paradise . . . .
Leinster Bay looks across to the British Virgin Islands. We enjoyed snorkeling here, and on our last visit saw a small grey shark, along with colorful fish and sea turtles. Catch a ride? 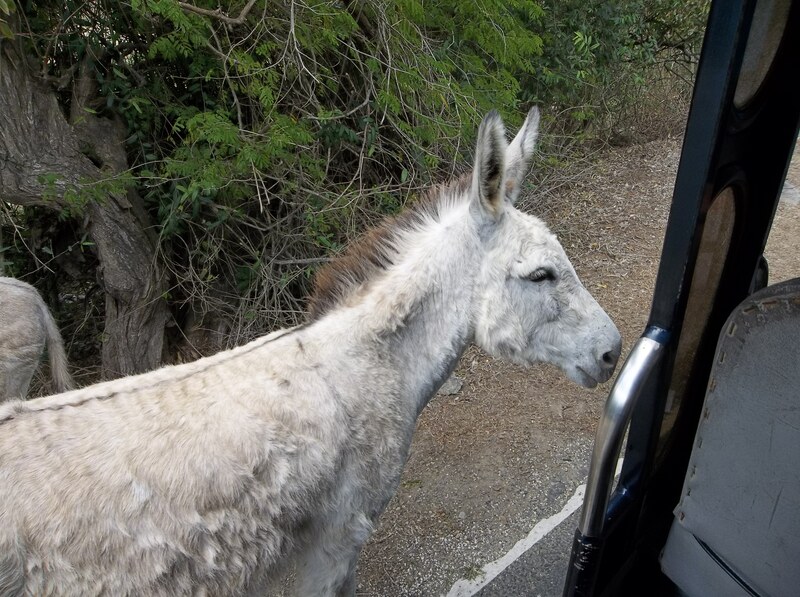 . . . .
Feral donkeys roam the island and this fellow didn’t want to surrender the road to passersby. Have you seen the wind? . . . This giant tree is quite ancient and grows near the beach at Hansen Bay. 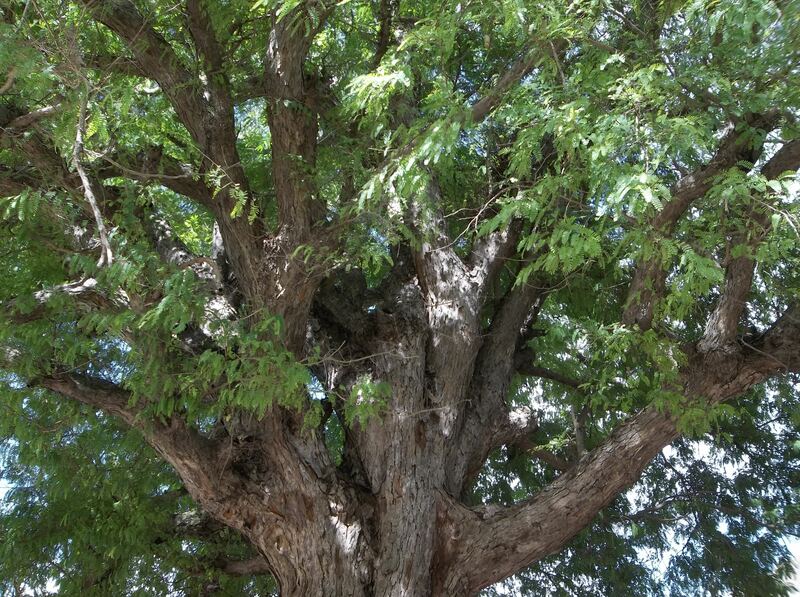 I believe it to be a tamarind, but notes and memory fail me. We spent the day snorkeling at Haulover Bay and at Hansen Beach. Lunch at Vi’s roadside stand was quite delicious – BBQ pork or conch fritters. Someone came before us . . . . 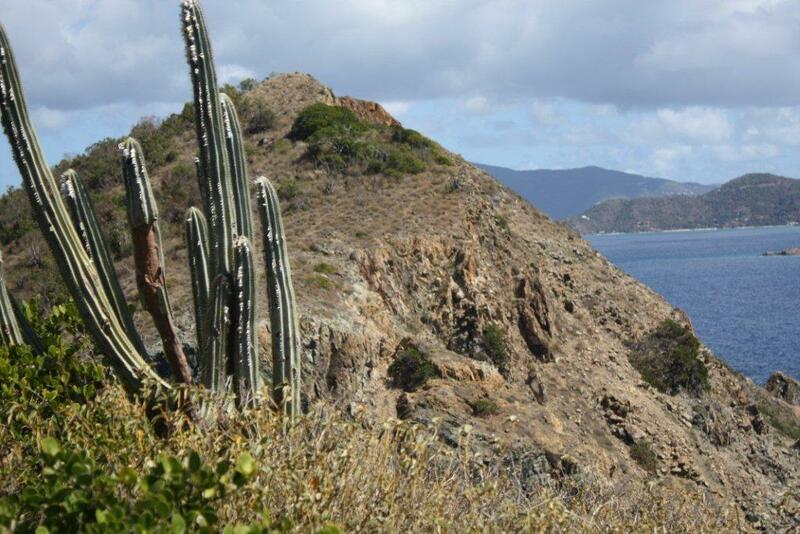 The Virgin Islands were originally settled by the Ciboney, Carib and Arawaks. 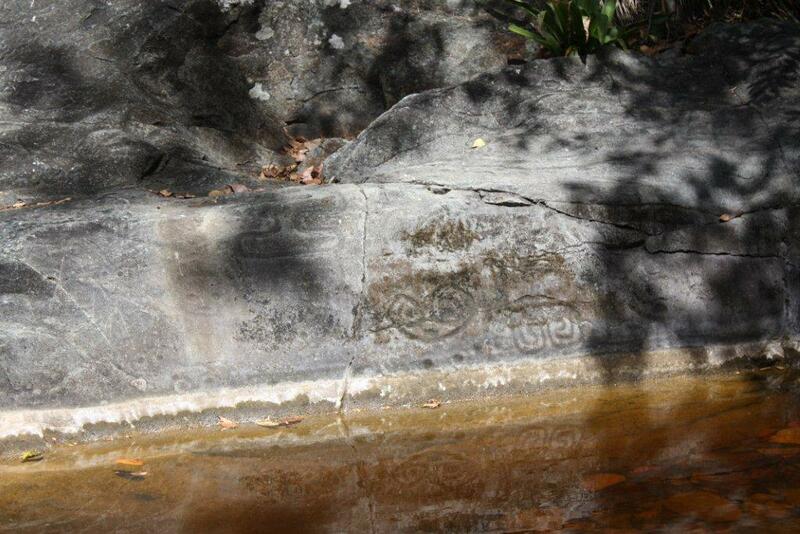 These prehistoric carvings at a sacred waterfall may have been created by the native tribes or may pre-date them. when sugar was king . . . . 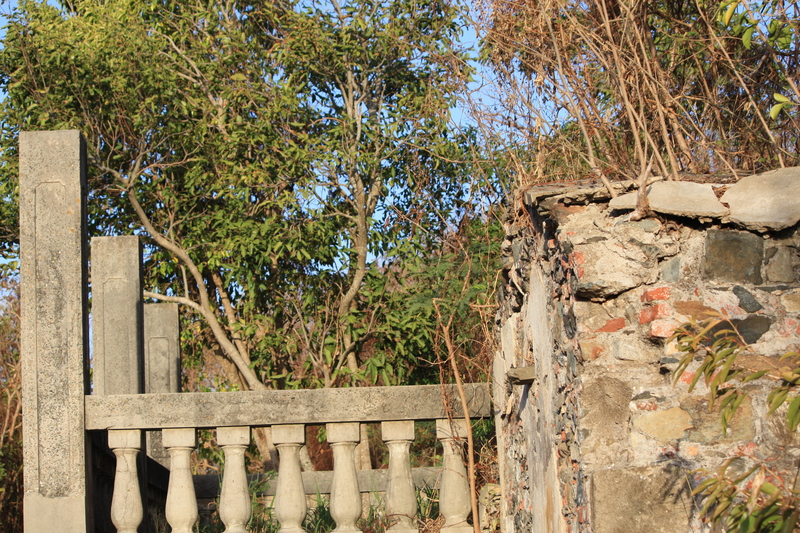 Ruins of Danish sugar plantations and mills developed in the early 1700’s still stand along the Reef Bay Trail and are sprinkled across St. John. 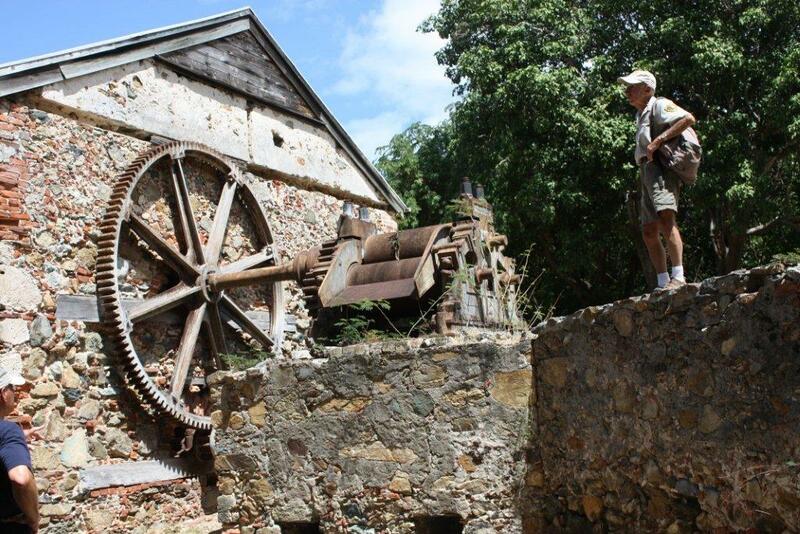 A National Park Service tour guide explains the functions of this well preserved mill. Lead me to “the baths” . . . .
Virgin Gordo is in the British islands and is world famous for “The Baths,” a unique rock structure that forms natural, partly submerged sea-grottoes that extend along the shoreline. 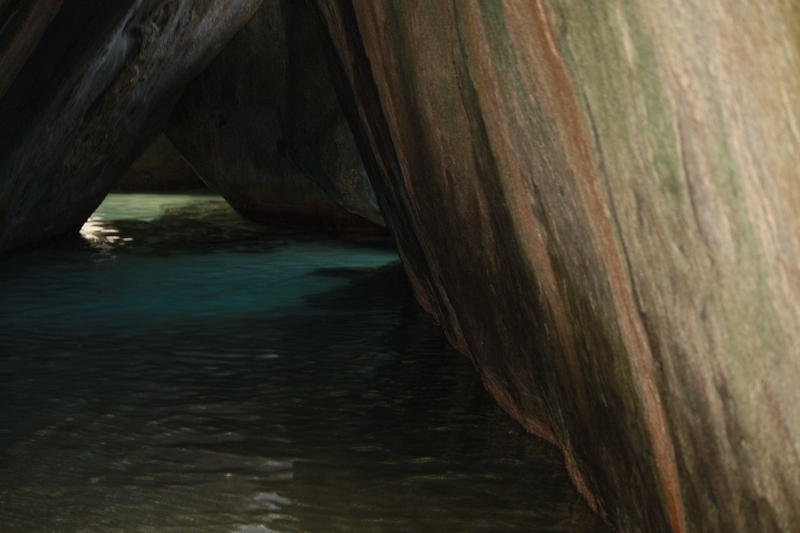 Ooooh, not for the claustrophobic . . . .
Incredibly beautiful grottoes like this one can be explored until about 4:30 in the afternoon, when the tide comes in and fills the huge rock formations with water. Splish splash, I was taking a bath . . . . Interesting vantage for a rest and to escape the crowd from a Club Med cruise ship that arrived shortly after we did. A picture is worth 1000 words . . . . The landward view from Top of The Baths restaurant. A few frozen margaritas later . . .
Did Harry leave me any crumbs? 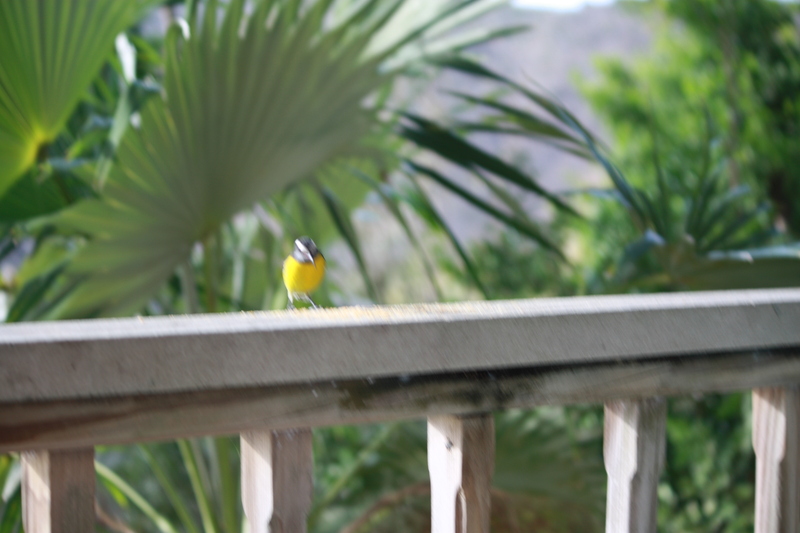 A bananaquit checks out the lunch counter. These small yellow birds are ubiquitous and are drawn to feeders like hummingbirds. All aboard for the high seas . . . . 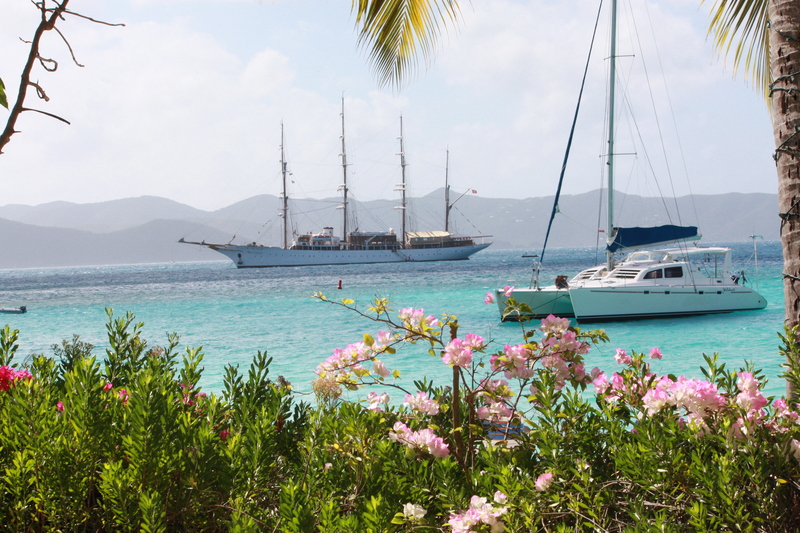 Dropping anchor in another British island, Jost Van Dyke. Bloody Mary for breakfast? . . . 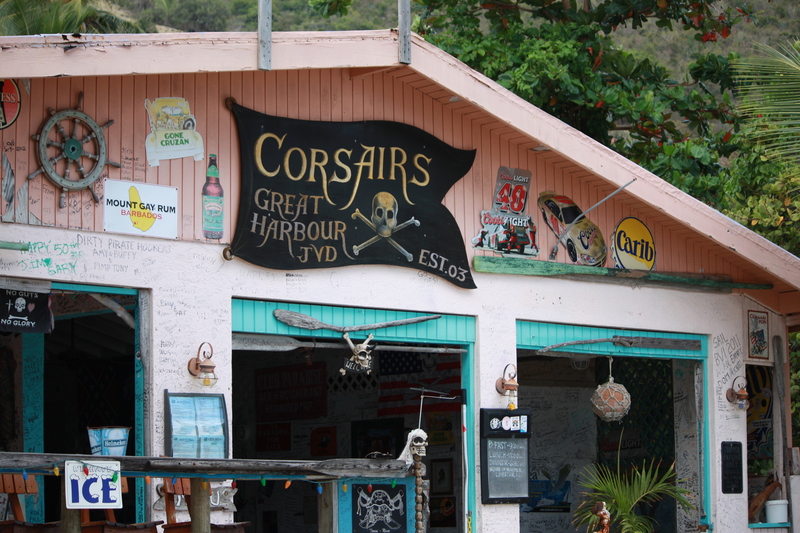 It all started at the Soggy Dollar Bar. 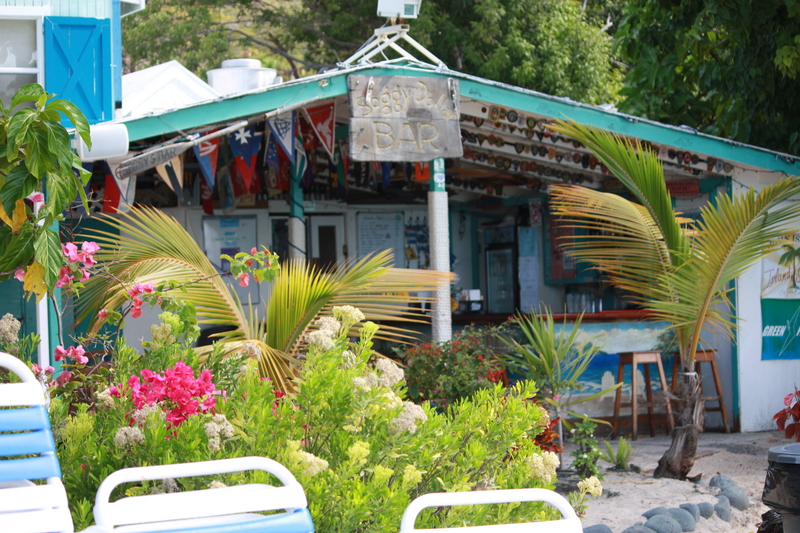 Jost Van Dyke consists of beautiful beaches and a string of bars. And very little else. Our goal was to visit every one (well, almost every one). Ivan The Terrible presides . . . . 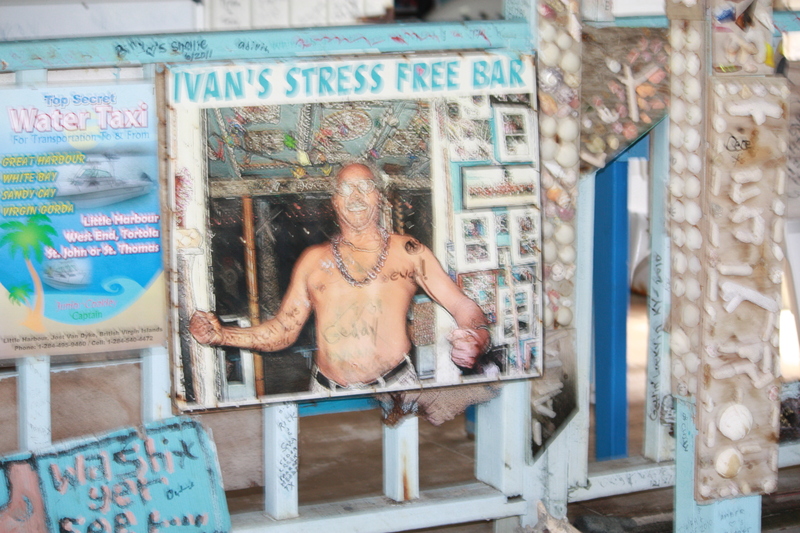 The trip down the hill to reach Ivan’s No Stress Bar should have been a fair warning. Climbing back up was a killer and definitely not without stress. 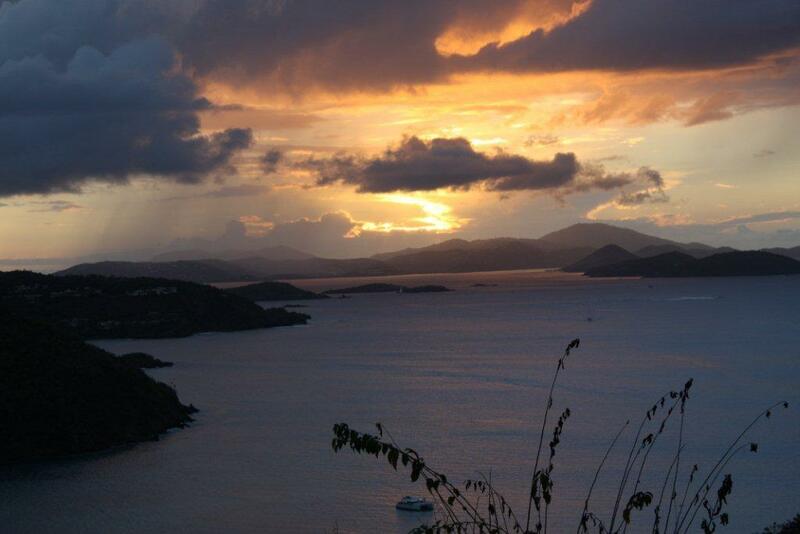 St. John is made up of volcanic mountains jutting up out of the sea. Everywhere you go is either up, or down–steeply! Who needs Painkillers? 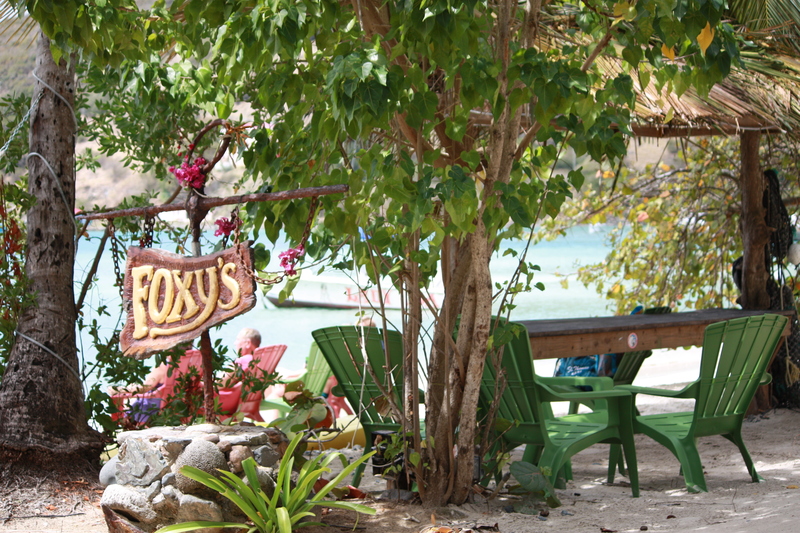 . . . .
Foxy’s is the most famous establishment on Jost Van Dyke. Would not have missed it for anything, and Foxy was actually there holding court. Lunch was conch fritters and Caribe beer. We passed on Rudy’s Ala Baba bar and a few others to take in the more respectable haunts. All the creature comforts of home . . . . The Methodists are alive and well, doing God’s work around the world! Not another bar! . 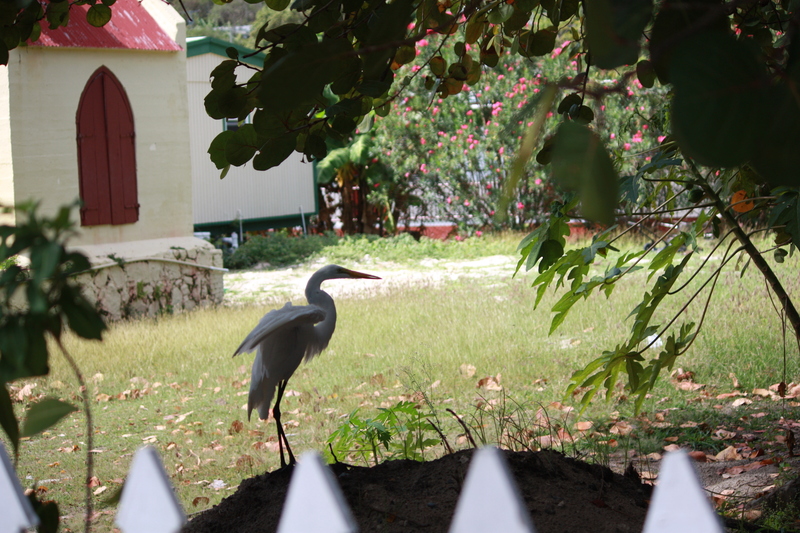 . .
An egret had a tussle with a mongoose, and the mongoose got away! 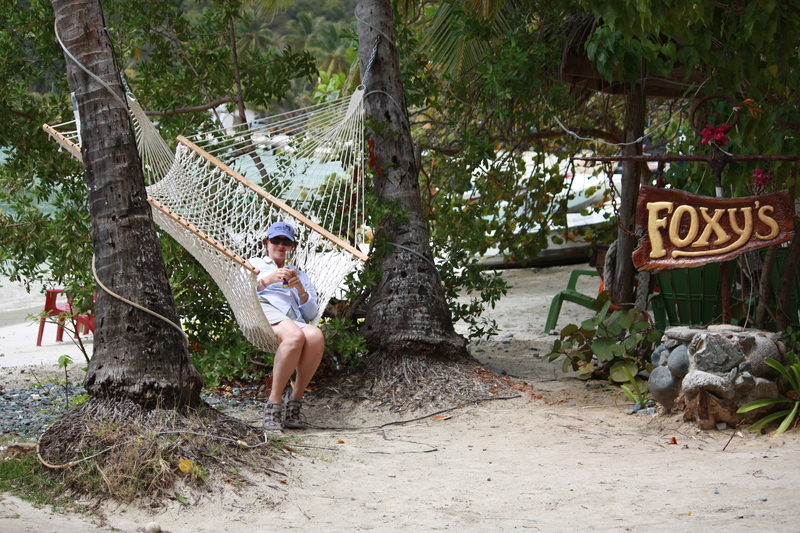 Back to Maho Bay, our base on St. John, and our visit to the Francis Bay salt pond. So many wonderful birds it was impossible to capture them. 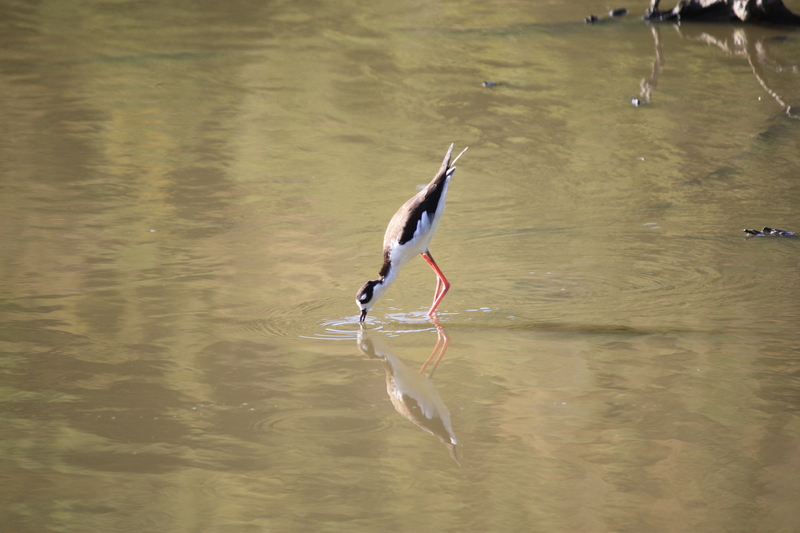 This Black-necked Stilt is fishing, or quite possibly enjoys looking at his reflection in the water. I can see it from here . . . .
Ram Head is on the “dry,” or east end of St. John and this windswept peninsula has beautiful cacti and other arid-lands plants. 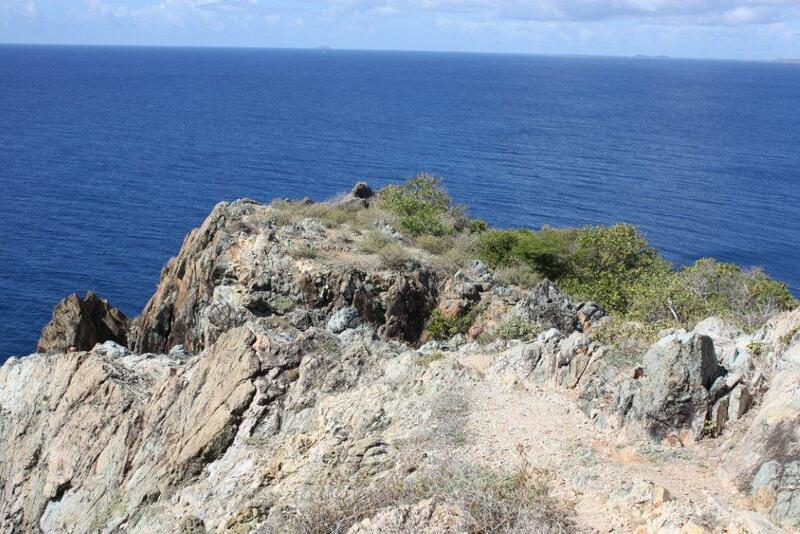 The trail leading to this prominent point is rocky, torturous, prickly and steep. Leaving from Salt Pond Bay, you immediately notice the heat, but as you climb up the ocean breezes are a welcome relief. did rebellious slaves really get a drink from me? 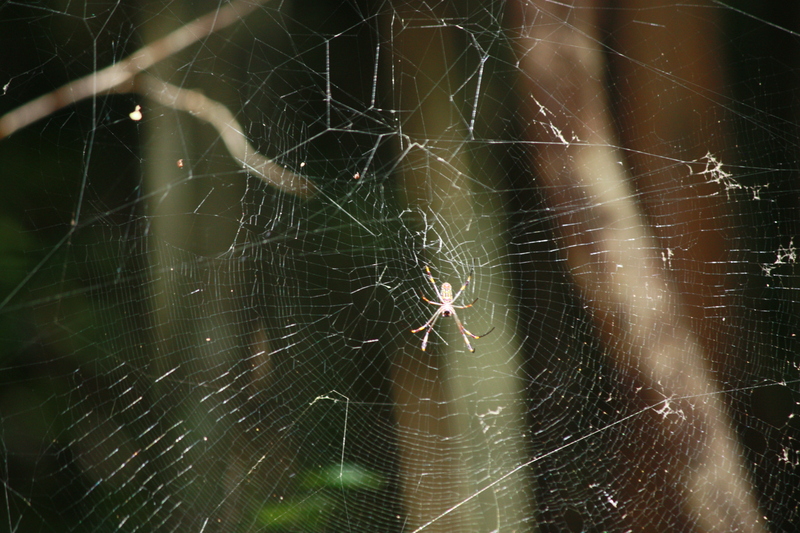 . . . .
wouldn’t want to be blown into one of these . . . .
St. John has some of the best examples of dry tropical forest remaining in the Lesser Antilles on the east end, but the west end is moist forests of West Indian locust, hogplum and yellow prickle trees. 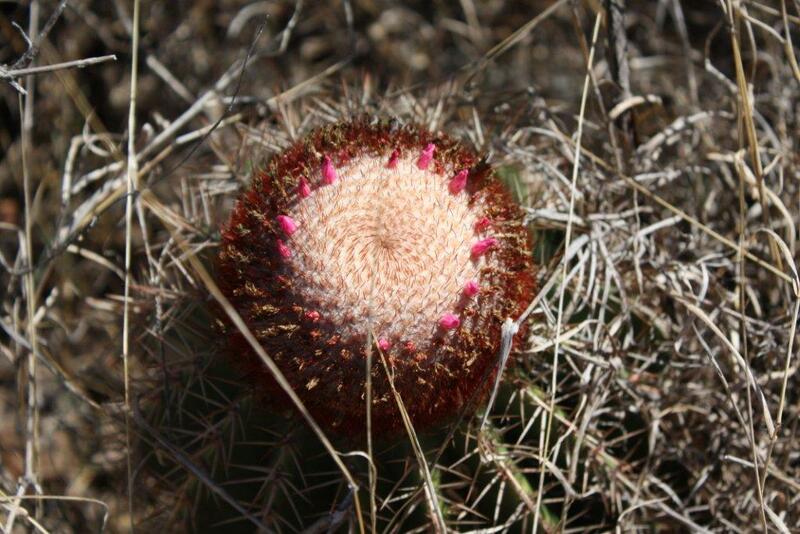 The constant winds on Ram Head would dry out plants that are not adapted to these desert-like conditions. 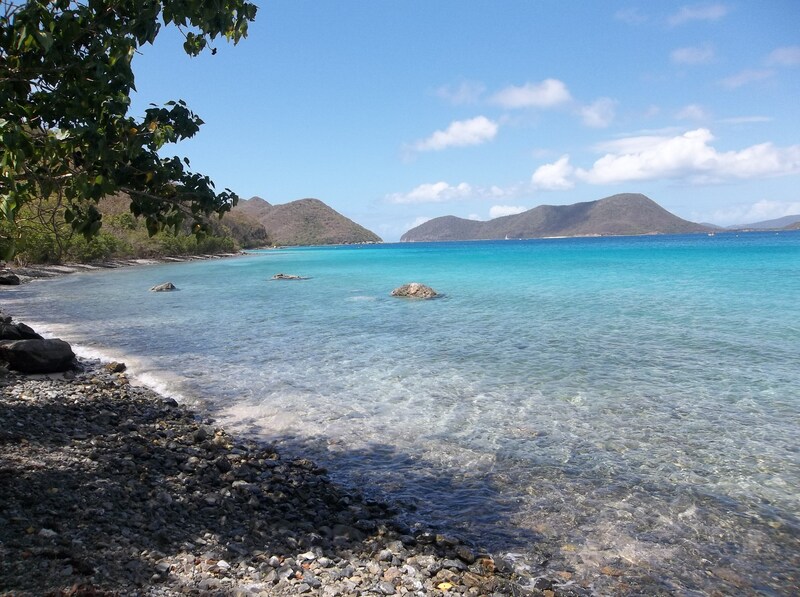 Maho Bay is calling . . . . The End, until . . . . . 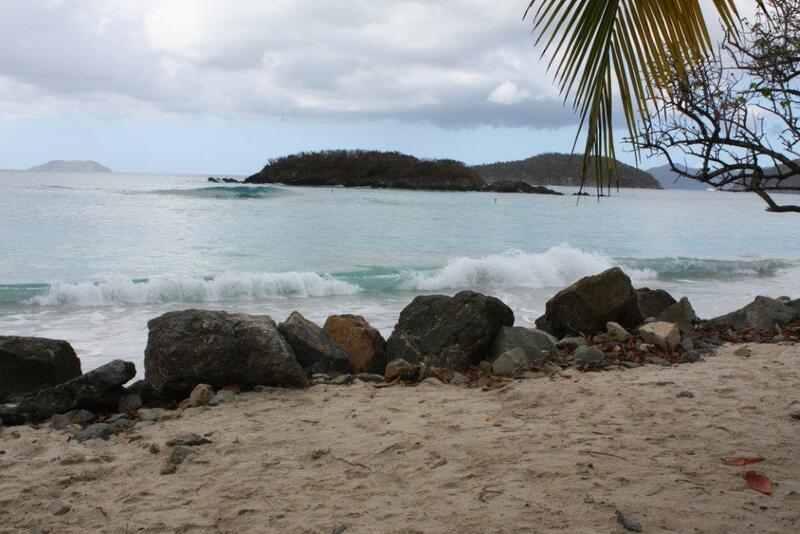 This entry was posted in Worldly and tagged cruz bay st john by bygeorge. Bookmark the permalink.